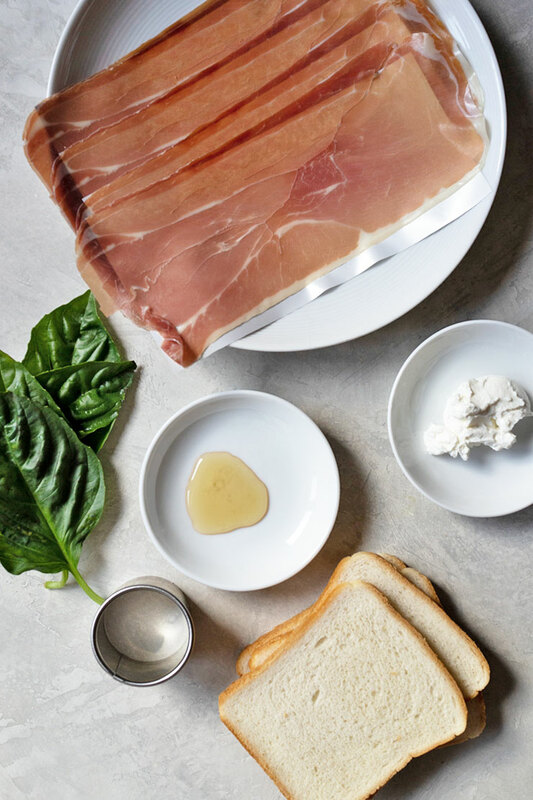 The creamy goat cheese, salty prosciutto, sweet honey, and peppery fresh basil makes for a great flavor combination. These sandwiches for tea time or party appetizers are so good. You can thank me later. In cash. Years ago, I had an appetizer that was a prosciutto and basil wrapped around a ball of goat cheese and it was so delicious that I wanted to recreate it with this tea sandwich. 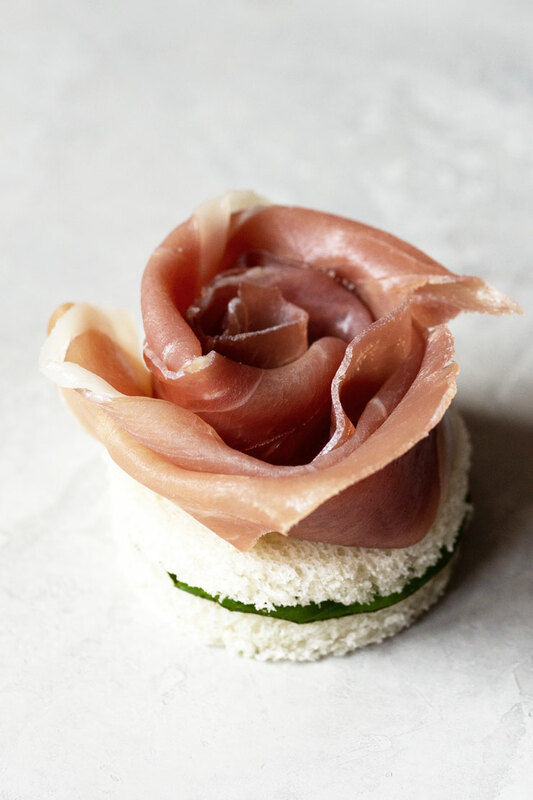 The beauty of prosciutto is in how thin they’re sliced, so I wanted to take advantage of that by creating a rose that can top the sandwich. They’re surprisingly easy to make. If I can do it, I have faith that you can do it. Prosciutto is basically Italian ham. It’s a cured meat and looks raw but it’s completely safe to eat. Sliced super thin, prosciutto is soft, buttery, and practically melts in your mouth. You may be able to buy prosciutto pre-sliced in the deli section of your supermarket or at a deli counter where you can request paper thin slices. Trader Joe’s has them pre-sliced and packaged for about $5 and there are about 8-10 slices per package. It can take anywhere from nine months to a couple of years to cure prosciutto — it’s an artisanal product so it’s not cheap. If you’re looking for an excellent summer snack, I would recommend wrapping them around melon wedges. It’s a great mix of sweet and salty. What Cheese Goes Best with Prosciutto in a Sandwich? Mozzarella cheese and goat cheese are my favorites but you really can’t go wrong with any Italian cheese when looking for the best cheese to have in a prosciutto sandwich. The MVP of my tea sandwiches. The hardest part of making this sandwich is the prosciutto rose topping. And by that, I mean making the roses without eating the prosciutto as you go. Ok, here we go, pay attention. 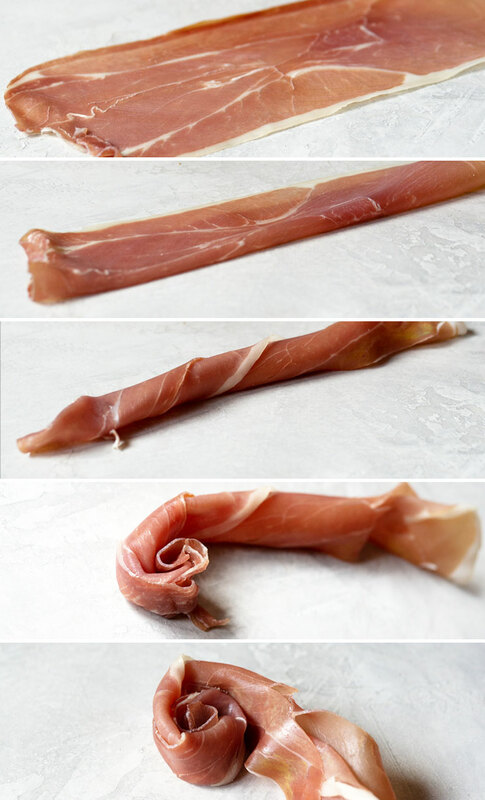 Take a slice of prosciutto, fold it in half horizontally, twist it loosely, then roll in from one end. Gather at the bottom as you roll, letting the top flare out a bit so it looks like a rose. See? Easy. And so pretty! Ok, let’s make the sandwich part where the rose will sit on top of. I love making finger sandwiches with round cookie cutters. It’s my secret weapon to getting perfectly uniform sandwiches. 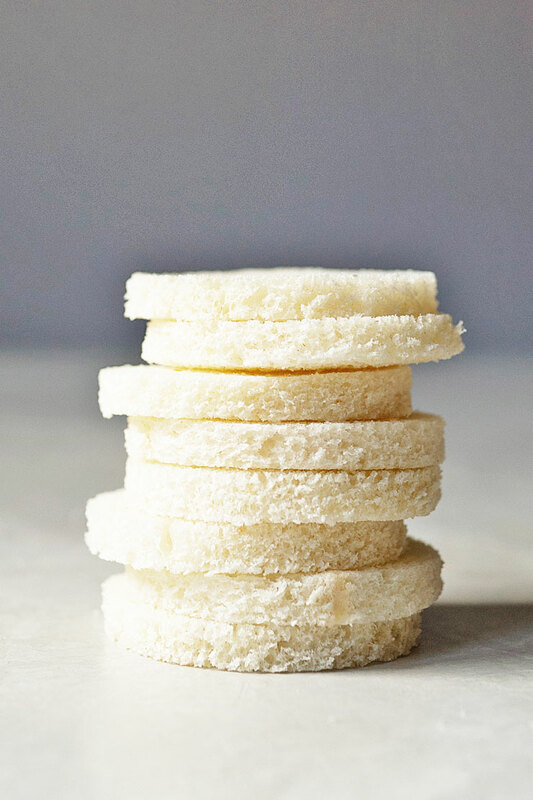 Tea sandwiches should be eaten in 2-3 bites, and by using a 2 inch cookie cutter it’s the perfect portion size. To make the sandwiches, go to town cutting out rounds from the bread. I pick a cookie cutter that can cut out two circles from one slice of bread. Using the Very Thin white bread, I can get two circles by using a cookie cutter that is a little smaller than 2 inches. For the love of all things holy, please avoid the crust. Ahem, there are no crusts in this crustless sandwich. Let’s not be barbaric. Next, cut circles out of washed and dried basil leaves. 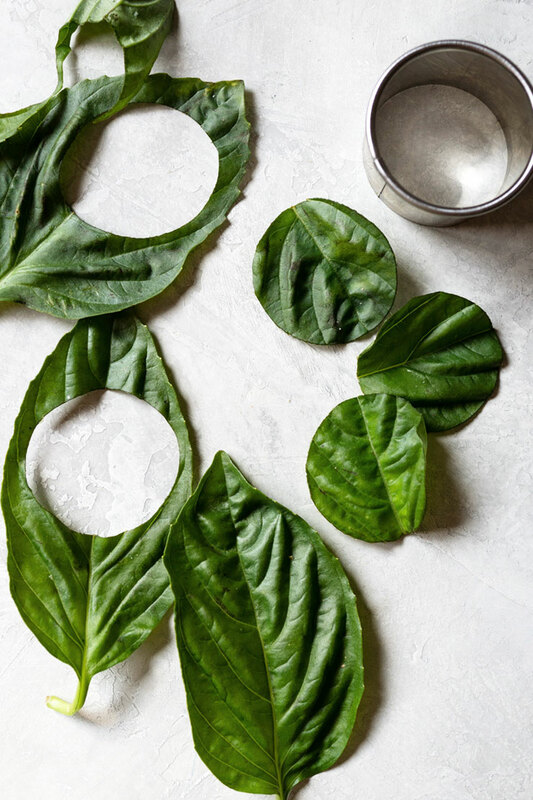 Pick leaves that are big enough to cut circles using your cookie cutter. 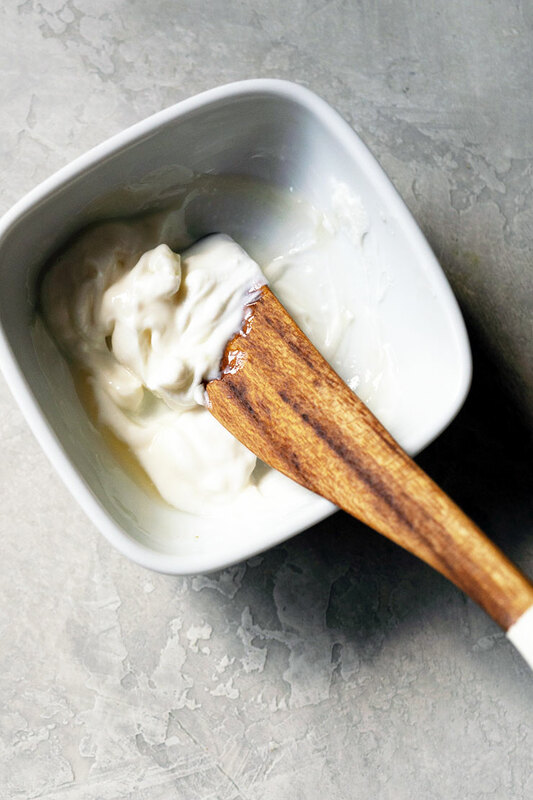 Mix the spreadable goat cheese and honey together. I use spreadable goat cheese since it’s smooth and makes it easier to spread onto the bread. Here’s how it goes: bread, goat cheese, basil, goat cheese, bread, and then goat cheese again. The top layer of goat cheese is to make sure the prosciutto rose stays in place. Place the prosciutto rose on top. 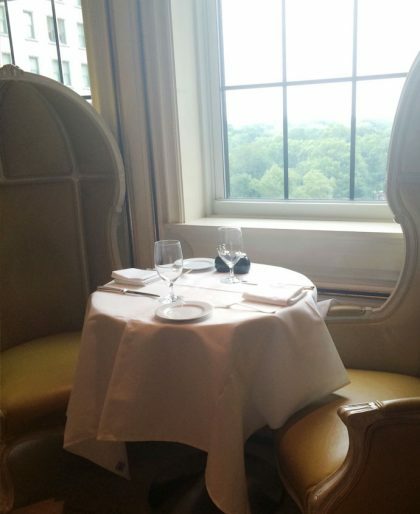 With rich flavors from the prosciutto and goat cheese, I would recommend an oolong or a black tea pairing. 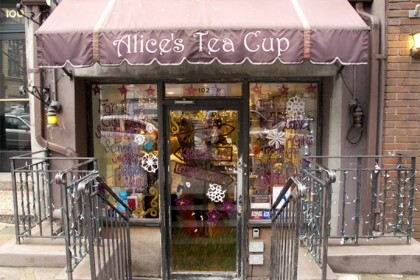 Try a roasted oolong tea like Frozen Summit or Formosa Oolong. For black tea, I would go with a classic whole loose tea like Ceylon or Darjeeling. 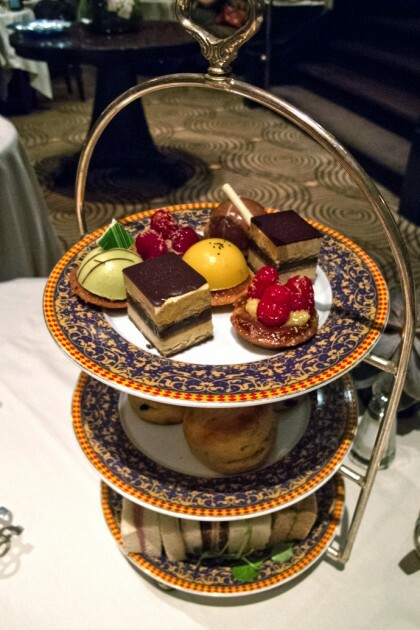 But you can always pair with a black tea blend like Earl Grey. 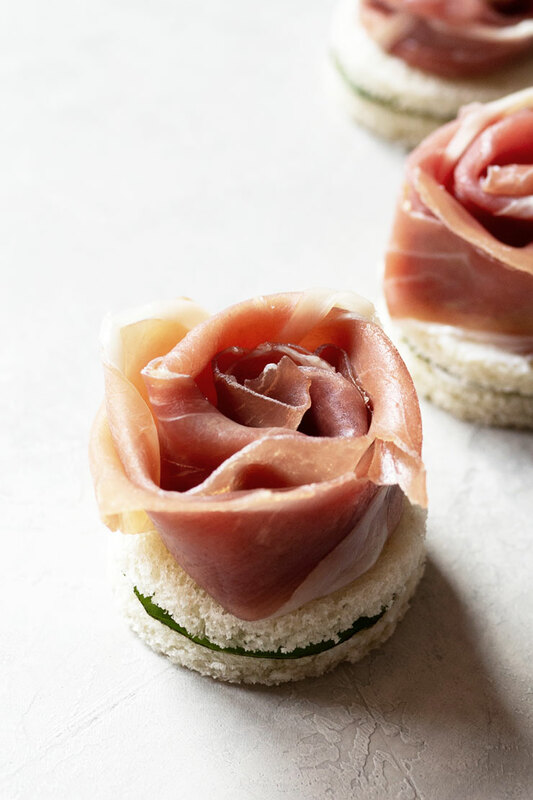 Adorable and delicious, these prosciutto sandwiches are a perfect tea time savory. Cut circles out of the bread using a round cookie cutter. Use a cookie cutter size that can cut out two circles out of each slice of bread. Cut circles out of the basil leaves. Combine spreadable goat cheese and honey. Set aside. 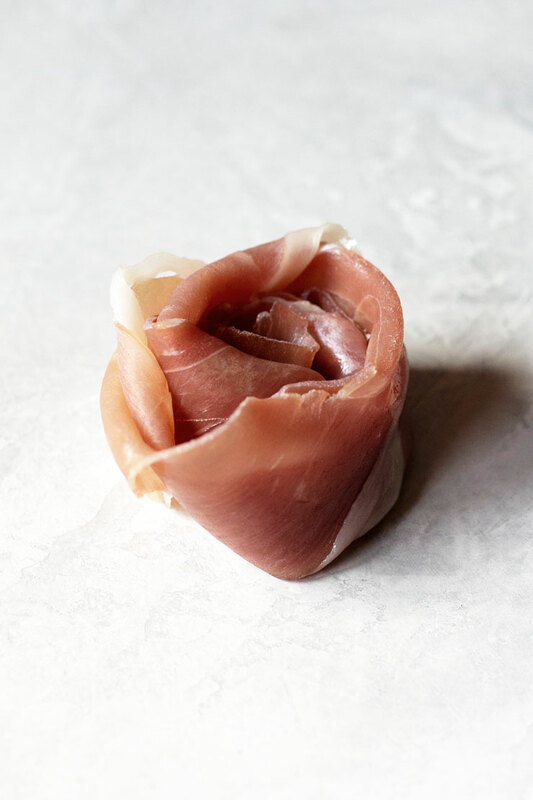 Make prosciutto roses by folding a slice of prosciutto in half, horizontally then loosely twisting it. Take one of the twisted ends and roll inwards with the top flaring out a bit to get the rose shape. 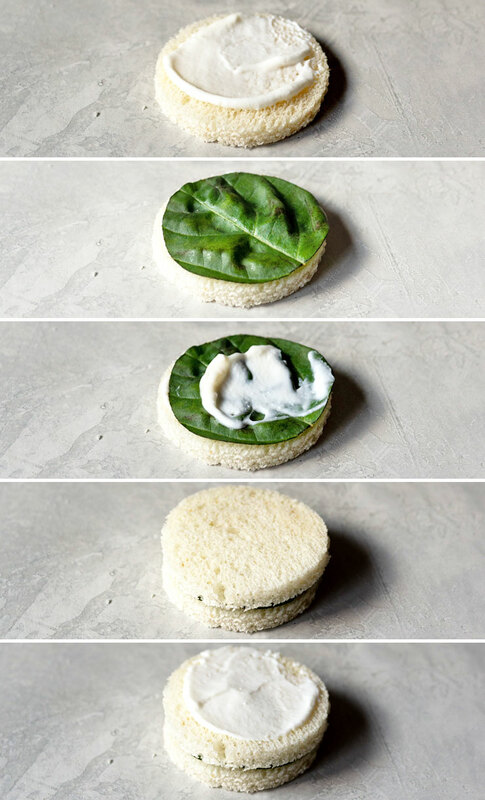 Assemble the sandwich by taking a bread circle, spreading on some goat cheese, layering on basil, goat cheese again, bread slice, then goat cheese on top. 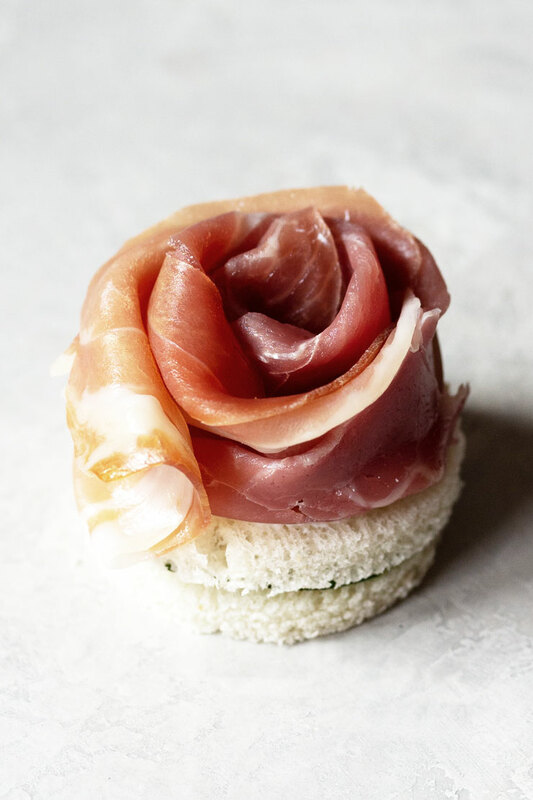 Top the sandwich with a prosciutto rose. Nice post. Beautiful how-to photos. The sandwiches look like they'd be delicious. Thanks, Adam! The sandwiches were indeed delicious. Thanks for posting your 201 year in review. This is a brilliant sandwich — the basil makes it! Hi notesontea, glad you saw this post! Yup, the basil TOTALLY takes it to another level.